Cutely named The Duloc Ticket Lottery to connect with the show, the drawing is held in the M&Ms World store (five blocks away from Shrek‘s Broadway Theatre). This is an interesting partnership between production and retail, as it seems to encourage commerce ‘while you wait.’ The only other show I’ve known to do this was the now defunct Young Frankenstein, which held its lotto drawing at the 42nd St. McDonald’s. That, however, was across the street from the Hilton Theatre and seemed convenient enough. I don’t quite understand why Shrek would hold its lotto drawing at M&Ms World when it is so far away (and the Broadway Theatre has an enormous lobby), other than they’re getting a small kickback from Mars Inc.
No waiting outside in the cold. Not having to get up at the crack of dawn to ensure a good space in line. Lotto registration begins at 9 a.m.; the drawing isn’t until 10 a.m. This was a particularly good time to play the lottery for this show. It’s the middle of winter, the holidays have passed, and spring break isn’t here yet for most schools. Also, Shrek doesn’t have any milestones approaching, like award nominations or a principal cast member leaving. I was one of the first to sign up, and the first name to be called. It really felt like I was getting away with something. But having lost the last couple of lotteries I’ve played (including the final performance of Title of Show, grrr…) I felt that it was my time. My seat was first row, left, on the aisle. It’s special when lottery or rush seats are in the front because it’s such a unique experience and perspective. True, it’s not the ideal viewing spot in terms of taking in an entire production, but an audience member will get to see things that hundreds of people in the theater will not. For instance, there are parts in the show where the role of Princess Fiona is actually not played by Sutton Foster, because she’s off stage getting rushed into her character’s ogre version. There’s a stand-in wearing the costume. At one point, the stand-in actually says lines for Foster. But no one who’s not sitting in the front row would be able to see this. Let’s get this out of the way, because it’s the issue that’s going to plague Shrek the Musical for as long as it runs, and it’s an unoriginal topic. 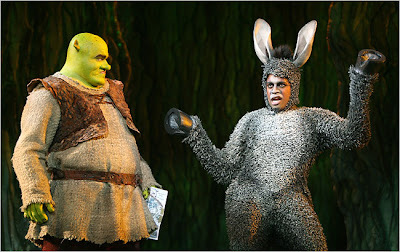 Shrek the Musical is not nearly as good as the film version. It’s an annoyance to judge these movie-to-stage shows, because we’ll either be comparing them to the films that preceded them, or making concessions for them. Should Broadway productions (or any creative product, for that matter) have to perform with a handicap like in bowling? I don’t think so. The show’s plot advances lightning fast, and not in a good way. If the audience didn’t have preexisting knowlege of the story, they’d be left in the dust by the time Shrek and Donkey set out on their quest. For this reason, David Lindsay-Abaire’s book to Shrek the Musical is probably the only weak aspect of the show. How disappointing, since Lindsay-Abaire won the Pulitzer Prize for his play Rabbit Hole. But what Lindsay-Abaire lacks in his book, he makes up for with his lyrics. The lyrics are what they should be for Shrek – whip-smart, charming nuggets of song. During Donkey’s first number (sang by the fantastic Daniel Breaker – more on him later), “Don’t Let Me Go,” I actually started laughing out loud, which I rarely do (I’m a laughing-on-the-inside kinda guy). The song builds in humor, but as the audience is laughing, the quality of the orchestrations (by Jeanine Tesori) builds in perfect synchopation with the lyrics. 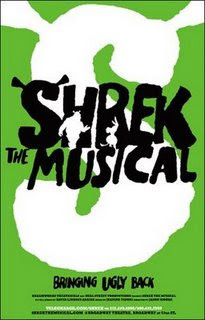 Not only is it one of the strongest songs in the production, but it’s the moment where Shrek the Musical separates itself from the other movie-to-stage shows. Naturally, Daniel Breaker shares the credit along with Lindsay-Abaire and Tesori for creating Shrek‘s first great moment, as he’s the performer who delivers it. Breaker’s casting in the production, although an extremely smart move, came as a shock, because the role of Donkey was supposed to be played by the very capable Chester Gregory, who actually did play the role when the production was running in Seattle. For reasons unknown to the public, the producers replaced Gregory with Breaker just over a month before Broadway previews began. Breaker is a Tony nominee for his (incredible) work in (the tragically short-lived) Passing Strange (pardon me, my bias is showing). Perhaps the producers thought Breaker would add even more gravitas to the cast’s already impressive prior achievements. Either way, Breaker is fantastic as Donkey. Although Passing Strange was a greatly dramatic work, he carries over the humor that he exhibited there wonderfully and much more abundantly into Shrek. While Breaker’s portrayal of Donkey is not a one-trick jackass (whimsical strides and floppy hooves make for big laughs), there is nothing better than Breaker’s pop-eyed stare. Although I can’t see an actor of Breaker’s talents residing in a – lets’ be honest – trite show for long, the massive public appeal of Shrek should give him some much-deserved clout when seeking future projects. Although he’s not singing the original version of “Build A Wall,” Brian D’Arcy James (last seen in Port Authority with John Gallagher Jr.) as Shrek is still quite charming. He conveys the right amount of emotion, which is a triumph, considering just how much makeup he’s under. The costuming and makeup for Shrek is a definite “Are you in there?” situation for James – it’s miraculous that he’s able to move his mouth or face at all. What’s most engaging about James’s Shrek is that he makes the belching ogre believable to the audience as the smartest, most sensible character in the show. To me, therein lies the real humor of Shrek – not the flatulence jokes. Certainly the strongest voiced in the cast is Sutton Foster as Princess Fiona. In her grand entrance into the show (a wonderfully crafted scene), three ages of Fionas sing about waiting for their heroic rescuer in their tower of imprisonment. After a cute little-girl Fiona (Rachel Resheff), and a teenage version (Marissa O’Donnell) sing their individual verses, Foster emerges with a startlingly solid voice compared to the previous two just heard. It’s a moment when you understand why this actress not only has a Tony award (Thoroughly Modern Millie) and two nominations, but also lead role after lead role in big-budget, highly publicized Broadway shows. Sutton Foster is the Julia Roberts of Broadway. Looking already like she could have been drawn by Disney (excuse me, DreamWorks), Fiona is a perfect role for her, as it’s not a prissy princess, but one where she actually gets to cut loose (literally, unfortunately) and use her comedic chops. The show is lavish and clearly spares no expense. But a show that spends the big bucks in these economic times should not be viewed as a negative, but rather an added gesture of good faith for the high-paying audience that the production is dotting every “i.” There are at least eight scene changes (and those scenes change repeatedly too). There are elaborate costumes for the ensemble (note that the costumes can’t even be the same, as the ensemble consists of Peter Pan, the White Rabbit, and the Big Bad Wolf). Even Pinocchio’s remote-controlled nose telescopically extends off John Tartaglia’s face. But the most creative details are the impish, foam-stuffed legs of Lord Farquaad (Christopher Sieber). Sticking out in front of him, while Sieber has to perform on his knees, the rest of his body hidden by a massive cape, the legs are hilarious. What’s even more creative is that rather than have the image of Lord Farquaad just standing there scene after scene, the joke becoming stale, new humor is pumped into the image by putting Sieber in different scenarios – riding a horse, sitting in a bathtub. The ensemble even dances with the vertically challenged villain in one scene, even lifting him into the air. Good for the tickled audience, sad for Sieber’s ligaments. I’ve read that every performance, Christopher Sieber changes the name of the horse that he rides in on as Lord Farquaad in Act II. So it goes, “Whoa, [insert name of horse]!” I just wanted to note that at my performance, the horse’s name was Beyonce. So in a situation where a show is walking the ever-criticized path that has been paved by dismal movie-to-stage musicals such as The Little Mermaid and Young Frankenstein, it is the attention to details that saves the show. Luckily, an ogre in a swamp knows that.